Best Multimeter – Measure with Pleasure! Multimeters or volt-ohm meters are useful troubleshooting devices for both professional electricians and amateurs who like to repair things around their home on their own. These tools enable you to measure voltage, current, and resistance in circuits of numerous electronic devices. Multimeters have a long history as they exist as long as electricity that powers our lives. As the name suggests, they are multi functional tools and usually measure AC or DC voltage, impedance, and current, temperature, capacitance and frequency, replacing a number of different meters to make your job easier and your toolbox lighter. For all these reasons stated, we have set out to find five currently best multimeters on the market, but also inform you on all you ever need to know about them. So if you are interested in buying a multimeter anytime soon, sit back and enjoy reading. Analog vs. Digital – Which to Choose? What Makes the Best Multimeter Best? As already mentioned, a multimeter is an important electronic tool which measures a number of functions of electricity such as raw voltage, resistance, and capacitance. Most commonly, you use it to test if a wire or circuit is live in order to diagnose where the problem is and fix it properly. In other words, it quickly finds fault in a circuit by checking its completeness and the voltage from a power source. ​Multimeters are unquestionably essential in many areas of technical work, and there are different types you can choose from according to your personal preferences and the intended use. Typically, you can decide on the number of features, specialty probes and add-ons that can be purchased. First of all, though, you have to select between two types- analog and digital. We have already pointed out that there are two different kinds of multimeters: analog and digital ones. 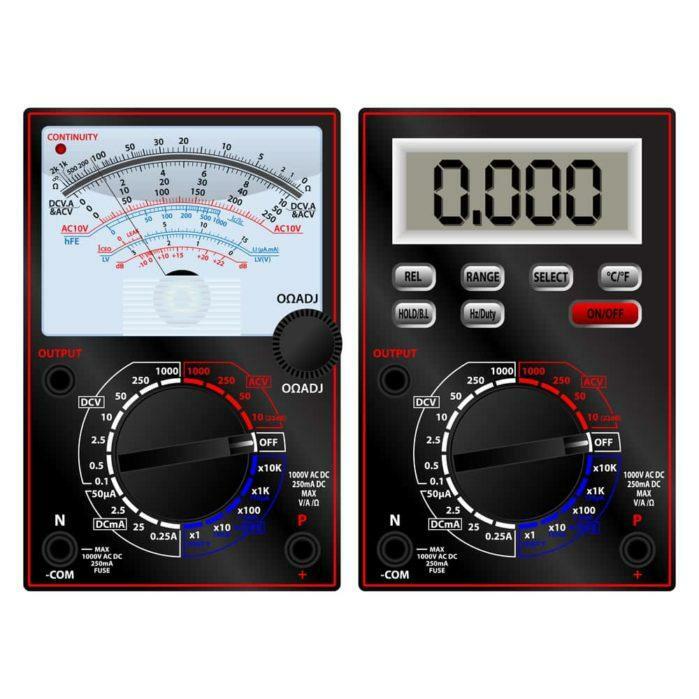 The main difference is in the way the two display the measurements- the analog multimeter uses a dial with a pointer, while the digital one uses a digital screen. The first multimeters used were, of course, analog and they still exist, though in a much lesser extent, mostly thanks to the fact that they are a cheaper option. They are also better when it comes to voltage fluctuation as the gauge changes in real time and the needle moves smoothly to show how the energy changes. On the downside, they are less precise and harder to read than the digital models. Analog models are liable to parallax errors when you look at the gauge from the wrong angle, and you always have to make sure to look dead-on at the meter as to avoid any misreading. The greatest drawback of analog models is that they are able to read only voltage and ohms. If you will use the multimeter only from time to time, and for some minor in-home repairs that do not call for high precision, you can save some money and go for an analog type. In modern days, digital multimeters are more common and the best option you can choose. They surpass by far the analog models in precision but are also usually more expensive too. Their digital displays are easy to read, and most of them can read down to several hundredths or even thousandths of a unit. As a definition digital multimeters offer more functions than the analog ones; even the simplest models are able to read ohms of resistance as well as voltage. Better digital models are often able to give you an accurate reading of almost every aspect of the electric energy you are testing in a matter of seconds. Multimeters are rated for different voltages, or at various CAT levels. In order to protect yourself from over-voltage, you have to check if the certain model is safe for the range you will be using it. Both the main voltage and transient voltage have to be considered. Sudden impulses of current can damage the multimeter if your meter’s rating is exceeded, so make sure you are acquainted with all the CAT categories as they are designed to keep you safe. Suitable for use on circuits not connected to the main power supply such as 24V circuits. Suitable for electrical devices which are plugged straight into the power main and most 110V to 240V systems. The circuit has to remain under 100A and have the protection that keeps it under 22,000V. Suitable for most of the applications before the main breaker. This category covers the right protection for devices plugged in continuously to the main such as the three-phase motors of the refrigeration systems. Suitable for the direct power source into a building from the transformer. The best multimeters have a fuse which cuts-out if the level of amperage is unsafe, and protects both the meter and you. Some models also cut out when exposed to higher amperage for long, which can be a lifesaving feature. Most multimeters are rated for a particular range of electrical energy so be sure to check if the model you are interested in corresponds to your needs. Some high-end models can cover a wide assortment of uses, from working with a power main to measuring mV. Check for both AC and DC specifications. If you work in a field and use your multimeter daily, its size will matter. Often measuring is performed in tight spaces and a smaller meter that can fit the working space is a must. As dropping tools and numerous other mishandlings are common issues when out in the field you will want a rugged meter with much protection for most applications. Opt for the most durable and the smallest multimeter in your price range. 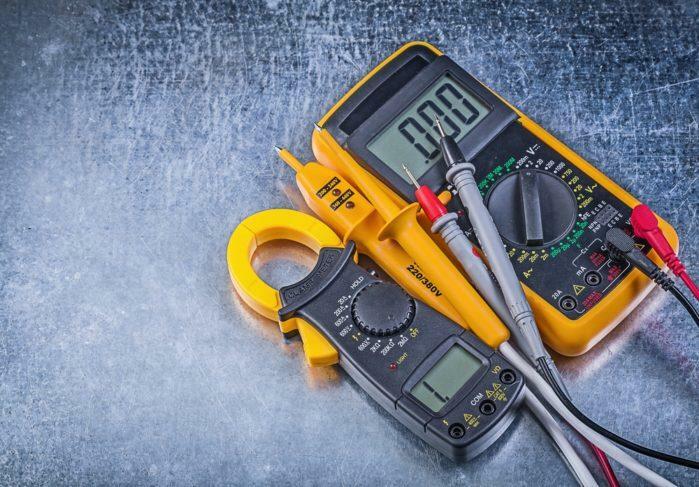 With the right accessories, you can expand your meter’s uses and better its practical functionality but make sure that any additional equipment you buy is compatible with your multimeter in every way. Leads- There are two most common types- the ones that are simple tapered pieces of metal and require holding, and clamp style leads that allow you to have one or both hands free while measuring. Temperature probes- They allow you to take temperature measurements without an additional device. Amperage clamps- Read the amperage in a line without the need for physical contact, just open the ending claw, pass it over and let it close. It is best that you find a multimeter with the longest warranty available. 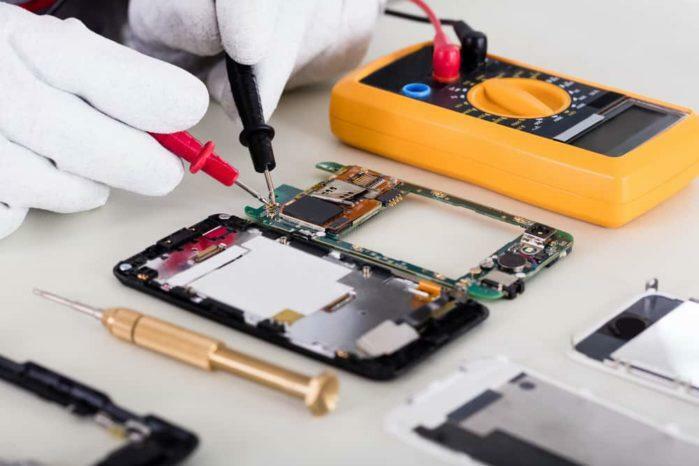 Most multimeters are covered for at least one year, and if you discover some defects in your meter during that time, you will be able to get the issue resolved promptly. Be aware that you are going to deal with dangerous currents, and if your multimeter malfunctions you can end up hurt, or even worse. Make sure that all safety requirements are met before you decide to save money on a less expensive model. Fluke 87-V is appropriate for industrial use, durable and has a number of features. This meter can measure resistance, capacitance, and frequency and even comes with a built in thermometer with a range of -328°F to 1994°F. For more delicate measurements you get a temperature probe that can measure from 40°F to 500°F. The Fluke 87-V comes with a removable holster, built-in probe, TL75 test leads, AC175 Alligator Clips, 80BK Temperature Probe, and a nine-volt battery installed. It is accurate to 0.05% DC and True-RMS AC voltage and current offer accurate measurements on non-linear signals too. An audible warning alerts you if you misuse the input jacks. This multimeter measures up to 1,000-volt AC and DC, and up to 20 A for 30 seconds, but also resistance, continuity, and frequency to 200 kHz. It is able to withstand sudden pulses of up to 8,000V and is the only meter reviewed which can accurately test adjustable speed devices. CAT IV 600V/CAT III 1000V rated, it also complies with the 2nd edition of ANSI/ISA S82.01 and EN61010-1. The lifetime warranty guarantees the quality. Amprobe AA-510 is a budget-friendly, industrially rated multimeter which offers sound accuracy and most of the functions of high-end meters. It tests voltage, current, and resistance. It is, however, more appropriate for use around your home than the professional use in the field, and has a bit slower response time than some of the more expensive models. CAT IV 600V/CAT III 1000V safety rated, it meets EEA requirements and IEC Safety standard 61010. It measures AC and DC to 10 amp and 600 volts (V), resistance to 40 mega ohms, frequency to 10 megahertz (MHz), capacitance to 100 microfarads, micro current to 4,000 micro amps, and duty cycles to 99 %. The Innova 3320 is excellent for such an inexpensive unit and an ideal choice for in home use. It is well designed and built, and we especially liked the side grip texturing which minimizes the chance that you will drop and damage the unit. It runs off 2xAA batteries and has an auto-off feature (15 min) which prolongs the battery life. The Innova 3320 has an auto-range function, which means it recognizes what is tested, and delivers the wanted measurement at a reasonable response time. However, auto ranging takes a bit more time than the manual one. It is only a CAT II rated meter, not suitable for testing the higher potential voltage and energy. It reads voltage up to 600Vac and 600Vdc, AC/DC current and also has two temperature inputs. During measuring the display updates three times per second displaying all measurement changes. It also has a Min/ Max feature, but it transfers the meter into manual range; if there is a transient min/max value outside of that range, only 'OL' is displayed. A built-in stand and a wrist strap are both convenient for a true hands-free operation. The Extech is an award winning meter with competitive price and array of features. It tests voltage, current, capacitance, resistance, temperature, frequency, duty cycle and diode/continuity. If you add common features such as auto-ranging, auto-power-off, and a continuity tester, you realize that you get more than enough for the price you pay. It runs on 2xAAA batteries and comes with type K temperature probe, a tilt stand for a convenient hands-free use and the protective case good for protecting the unit in the fields. Cat III 600V rated, it is good enough for professional users at a fraction of the price of some other more advanced units. The EX330 multimeter measures up to 600 volts DC/AC voltage with a 0.5 percent accuracy, and DC/AC current to 10 amps. It also measures frequency between 0.001Hz to 10MHz and resistance from 0.1 Ohm (min) to 40M Ohm (max). The only thing we have felt lacking for this multimeter to be deemed excellent is a True RMS reading and alligator clips. Fluke 115 multimeter displays True RMS voltage, current readings with 600 count resolution, capacitance, and continuity, and is rated for safe use in CAT III 600V Environments. It is also UL, CSA, TUV, and VDE listed. It can only go as high up as 10 Amps, which can be a deal-breaker for professional electricians, but it is accurate and reliable enough even for the most sensitive readings. In the package, we received the holster, 4mm silicone test lead set, and detailed user manual. The 9 V battery is already installed. It is somewhat disappointing that it did not include at least a case or a wrist strap. Test leads seem to hold their shape and are not as flexible as they should be for a hassle-free measuring, and LCD screen is a bit sensitive to the viewing angle. Useful features incorporated in the unit include auto ranging option, true RMS system for accuracy on nonlinear loads, a LED backlight to work in dark areas and Min/Max/Average option to record signal fluctuations. An audible warning alerts you if you use the input jacks incorrectly. Without a doubt - Fluke 87-V Digital Multimeter. As they say- you get what you pay for! In this case, you receive the greatest array of features and incredible accuracy, plus all the accessories you need for comfortable and safe use. If you do not want to empty your wallet, or simply do not need such an advanced multimeter, you can go for Amprobe AM-510 Multimete﻿﻿﻿﻿r, which offers a lot for amateur users. In fact, all multimeters reviewed here provide many useful features, and you can choose any of them with confidence. What Makes the Best Screwdriver Set: Things to Look Out For?